Almost a year ago, I discovered The Ordinary. I say discovered because it was seriously a ‘Eureka!’ moment for my skin. At the time, I was less than 6 months before my wedding and me being the way I am about my skin, it was my top priority. A lot you may think, but with a total combined price of £25, I didn’t bat an eye over it. I think out of the above, the Niacinamide + Zinc is my favourite. I have used it every morning since, and can honestly say it keeps those pesky one-off spots away. In the evening I would alternate between applying the retinol, which has an oily consistency (although this disappears overnight) and the vitamin C mixed with a few drops of the Resveratrol. With the AHA/BHA peel, this is serious stuff and only use this if you’re an experienced acid user. I’ve mentioned this in my Liquid Exfoliators post. I haven’t used this very often (maybe 2-3 times) but this is really because I haven’t felt the need for it. It’s super smoothing, and will leave skin a bit pink after but I can see why it’s popular. As I shared in my post ‘Hair care don’t care‘ I’m sceptical about hair products, but I have to say I have noticed significant less hair loss and breakage with this. 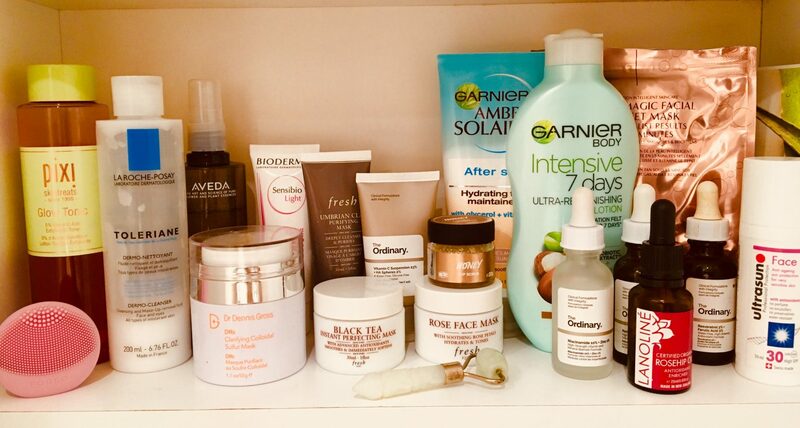 The Buffet I might switch out on some mornings with the Niacinamide, and the Lactic Acid instead of Retinol. A bit of background on the brand. The Ordinary sits within the brand Deciem- The Abnormal Beauty Company and shares its parent company with Hylamide and NIOD. It markets itself as ‘Clinical formulations with integrity‘ and highlights the fact it doesn’t use: parabens, sulphates, mineral oil, methylchloroisothiazolinone, methylisothiazolinone, animal oils, coal tar dyes, formaldehyde, mercury, oxybenzone. A Canadian brand, Deciem was invested into Estee Lauder and much was made of Deciem’s founder, Brandon Truaxe behaviour on social media and his unconventional approach to business (Estee Lauder eventually stripped Truaxe of his title to ensure a more stable leadership). Sadly, earlier this year, at the age of 40, Truaxe died and reports followed of suspected mental health issues and drug use. Prior to Truaxe’s passing, a friend of mine asked me whether my attitude towards the brand had changed based on the drama surrounding Deciem. Simply, no- the products speak for themselves. I’ve recommended these products to a lot of people and the price combined with their effectiveness, mean a happier purchase. My skin is clearer, brighter and smoother. So if you’re looking to change things up, The Ordinary could be a good place to start.